Last year, KPU student Matthew Woolin made it to the final round of the Great Canadian Sales Competition. This year Dilsharn Kaur is trying to get as many of her fellow students as possible to follow in Woolin’s footsteps. Kaur is an official ambassador for the nationwide competition, which sees students from 85 Canadian post-secondary institutions competing to make the best sales pitch. Whoever wins gets $7500 and a reputation that can help launch their post-graduation careers. Three students from KPU participated in the event last year, but Kaur is hopeful that she can bump that number to at least 35 in 2017. Students enter by submitting a 30 to 90 second-long video sales pitch on a topic of their choice. The production value does not need to be high, but for best results, topics should be well-researched and argued. “Anything that you are interested in and that you think you can speak on behalf of—if you have facts to prove it, if you know that you can deliver that message to the audience—just go ahead and make a video and enter it,” says Kaur. The competition is sponsored by major corporations like Google, IBM, Adobe, and dozens more. 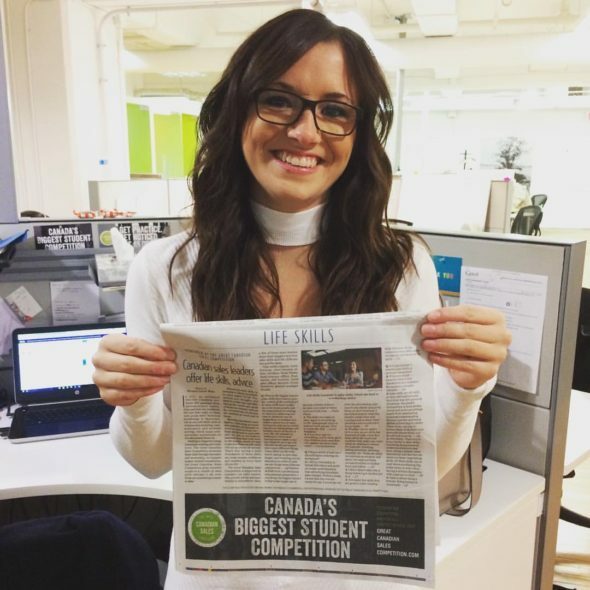 According to its official website, the purpose of the Great Canadian Sales Competition is to showcase the best of what a career in sales could look like to students. Participants who make it past the first round are paired with mentors from one of the sponsor companies to make a pitch for that company. Submissions for the first round of the competition are open until Dec 4 and the finals take place in May at Google’s Canadian headquarters in Toronto. Finalists will have their travel and accommodation expenses covered by the Great Canadian Sales Competition. Since the submission period for the first round began, Kaur has been hard at work pitching the competition to KPU students in the hope that more of them will represent their university at this year’s finals. Kaur has been visiting business classes, talking to students at a booth in the main building, and contacting student clubs like the Kwantlen Marketing Association and Enactus KPU. “Last year the winner was from BCIT, so I think if they can do it, we can do it too,” says Kaur. Matthew Woolin made his submission to the competition last year on an impulse. He spent a few hours researching and making his video, in which he argued that people should attend the KPU School of Business. After his submission was chosen for the second round, he was paired with a representative from sponsor company Bunzl Distribution as his corporate mentor to make a second video promoting the company. Woolin was then selected as a finalist and flown out to Toronto to make his final pitch in person at Google’s headquarters. “Any time you put yourself out there, anytime you do something that’s beyond what’s expected of you or would require extra effort, that’s always an opportunity to learn and to grow and develop,” says Woolin. Woolin may not have won the grand prize, but he says he has already received interest from potential employers as a result of his participation in the finals. His advice for participants this year is to make sure to put time, planning, and effort into the pitch rather than winging it. He says that the key to a great pitch is not just listing off product attributes, but identifying a need and explaining how the topic being pitched satisfies that need. “Take that time to really think about it, practice, walk through it, and just understand how [you] can convey whatever [you’re] pitching,” says Woolin.